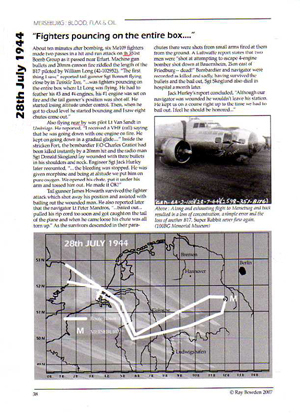 18 USAAF daylight missions covered. 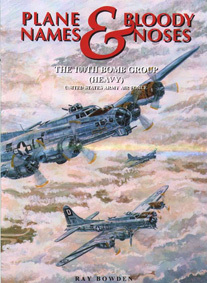 Listing of losses for more than 150 heavy bombers - almost all of them covered in the text. 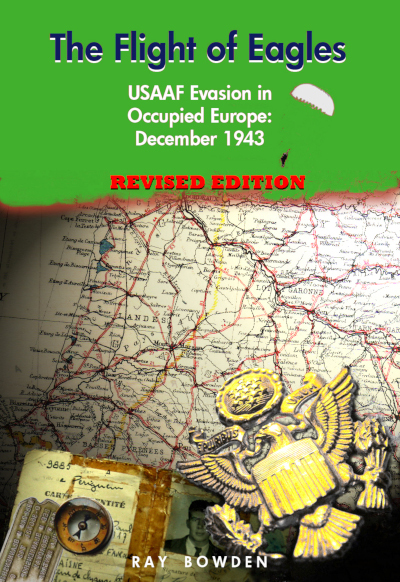 Archive material from US and German sources reveal the results,often previously officially described simply as "unobserved". 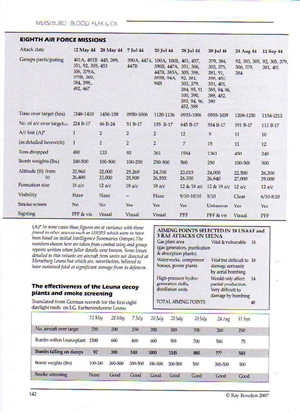 Summary of the three RAF night raids against Leuna. 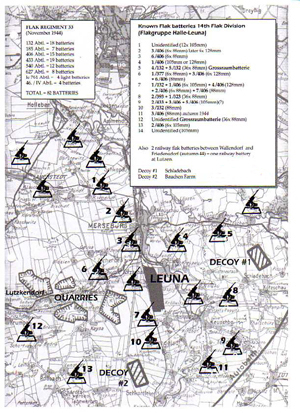 The target, the defences and the reasons for the attacks. "If I live to be a thousand I will never forget today, but I wish I could. Merseburg, 12 miles west of Leipzig -- PFF -- synthetic oil refinery." MERSEBURG and its Leuna synthetic oil plant - was one of the most feared targets in Germany. 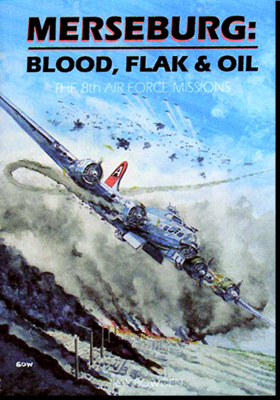 The USAAF's 8th Air Force began an 18 mission campaign against the Nazis most important oil production site in May 1944 as part of the wider Oil Plan. 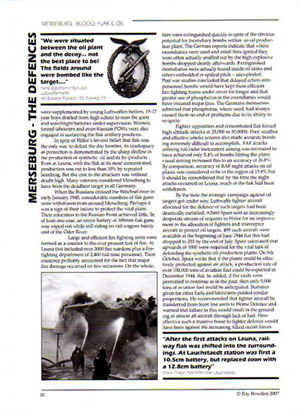 Initial attacks were successful but as the Germans began to realise the magnitude of the threat to their vital supply of valuable fuel and specialist oils the defences at Merseburg were expanded to become the most feared of all - surpassing even Berlin. Prior to the spring of 1944, few of the 8th's air crews had ever heard of Merseburg and its huge synthetic oil plant but that soon changed. 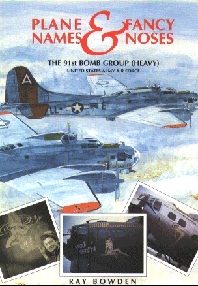 The remnants of the Luftwaffe bolstered by the newly arrived jet fighters and the enormous number of flak batteries which blossomed around Merseburg reaped a vicious harvest of US heavies, almost exclusively B17s. Veterans and survivors from both sides tell their stories, through recollection, diary notes, reports and official records. 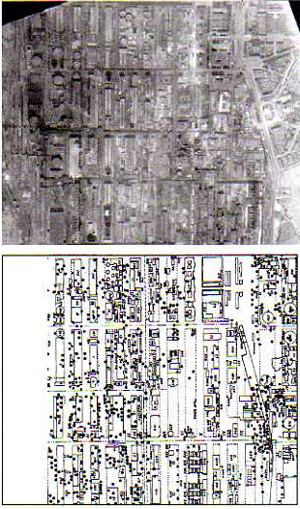 Target damage analysis from USAAF and German files and detailed post war studies reveal the results of the raids. 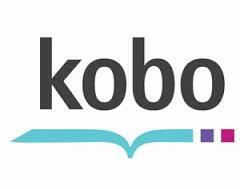 The destruction is revealed and the human cost - to friend and foe alike. 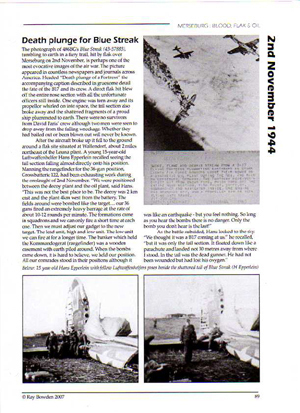 Heavy bomber losses over Merseburg (most are discussed in the book).